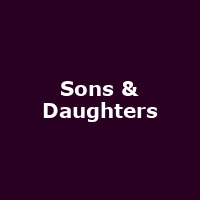 Since forming in 2001, Glaswegian indie-rockers Sons & Daughters have made a name for themselves with their brand of honest, occasionally punky, indie folk-rock. Conceived by lead vocalist Adele Bethel whilst touring with Arab Strap, Sons & Daughters have, in the decade since, put out an intriguing range of indie-rock sounds, swinging from electric bluesy folk to borderline 1980s' Gothic punk rock. Along with David Gow, Ailidh Lennon and Scott Paterson, Bethel's quartet has released four albums and achieved a handful of chart positions with both singles and LPs. The latest missive is fourth studio album (if you include 2003's 25-minute 'Love The Cup') 'Mirror Mirror', released in June 2011, and preceded by the free download track 'Silver Spell'. Issued on schedule with Adele Bethel's stated aim to 'release an album every three years', the sound of 'Mirror Mirror' is somewhat stripped-back compared to earlier outings and suggests there's plenty more to come from the maturing Sons & Daughters. The band are playing seven headline gigs in October, beginning in Aberdeen on the 19th, moving onto Dundee (20th), Leeds (21st), Bristol (22nd), Manchester (23rd) and London's Heaven (26th), before the final show of the short tour - a homecoming gig at the ABC in Glasgow on 28th October. The Bristol gig is on sale now, with the remaining dates available from 9AM on Wednesday 3rd August. All tickets are around a tenner.